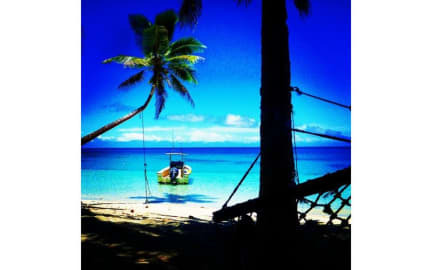 Mango Bay Resort i Coral Coast, Fiji: Reservér nu! CHECK OUT OUR NEW SURF SCHOOL AS WELL!! Depending on your budget, choose from our two types of dormitory bures (Mixed Dorm). Single bed dormitory (8 bed mixed dorm) has personal bedside table & light, bamboo screening for privacy & shared bathroom facilities. Safari Cabins (Twin Private) Featuring 1 x double bed & 2 x single beds with private ensuite, electricity, fan and floating timber floors; these unique Safari Cabins offer an eco tourist experience for guests. Beachfront Bure (Double Bed Private) Featuring 1 x queen size bed; private ensuite, fan, mosquito netting, private ensuite & outdoor shower. These bures offer stunning beachfront views. All accommmodation is inclusive of FREE daily Tropical breakfast - toast & spreads, cereal, tropical fruits, tea, coffee & juice. Enjoy loads of FREE activities snorkelling, kayaking, beach/pool volleyball, crab races, trivia nights, outdoor cinema, nightly happy hour, plasama SKY TV, nightclub & entertainment, welcome kava ceremony, midnight bonfire with acoustic guitar, coconut jewellery making, Fijian cooking classes, fish feeding, badmington, pool table, table tennis & intro to scuba diving lesson in the pool. 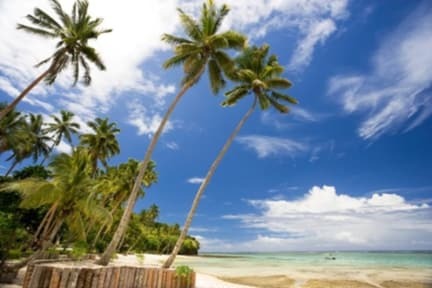 Also on offer is game fishing, PADI scuba diving, massage, village & water fall trips (small donation to village), horseriding, island & surf trips, sunset cruises, internet services, white water rafting, shopping trips to Sigatoka & Suva, tour desk plus loads more!